Many Hearts Keep Taste of Soul Alive; From the sponsors to the community, Taste of Soul is cherished and loved. On Saturday, October 15, the 11th annual Taste of Soul (TOS) will once again prove that it is undeniably the largest family festival in SoCal. For the past 10 years, TOS has shown that the residents of South Los Angeles are not the violent caricatures that popular media presents to the public. Presented by Bakewell Media, TOS was created for the community to come together and promote unity and brotherhood. The festival has been attended by over 350,000 SoCal residents and out-of-state visitors, who come to have a great time with friends, neighbors and family. TOS affords the opportunity to vendors from all over Southern California to make the American Dream a reality. 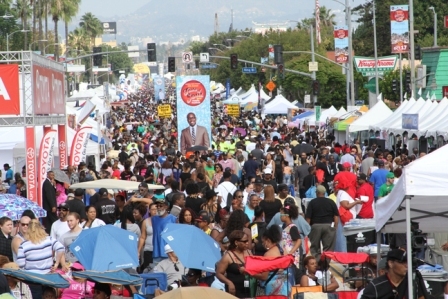 TOS has remained one of the most peaceful festivals in South L.A. with the added support of law enforcement, the Nation of Islam and emergency units. TOS vendors have included established or notable eateries and restaurants that include Harold & Belles, The Kobbler King and BBQ Smokehouse just to name a few. This festival is a foodie’s paradise but it also offers attendees and visitors the opportunity to meet non-food vendors selling wares, ethnic merchandise and valuable information such as health services, job opportunities and education. TOS also features some of the best entertainment thanks to faithful partners such as Radio Free 102.3 KJLH and 94.7 The WAVE. Both stages have featured classic and new R&B, funk, soul and jazz artists. McDonald’s will once again be sponsoring the Brenda Marsh Mitchell Gospel Stage in partnership with Holman United Methodist Church. In 2012, StarQuest debuted at the 7th Annual TOS Festival, a creation of the Los Angeles Sentinel and Bakewell Media. Now it has become the premier talent competition of the South L.A. area. This year, TOS’ StarQuest web auditions were a hit with two talented artists being chosen to compete in the singing competiton on the StarQuest Stage at TOS. This year, Hep C Hope is sponsoring the StarQuest stage. StarQuest has proven to be a reliable platform to launched local artists into mainstream entertainment. Those sponsors and partners include: Chevy, L.A. County, city of L.A., Metro, McDonald’s, South Coast Air Quality Management District, Bank of America, Fox Audience Strategy, Wells Fargo, Walsh/Shea, Ivie, McNeill & Wyatt, Chase Bank, Metropolitan Water District, California Resources Corporation, SEIU Local 2015, Charles R. Drew University, US Bank, Walmart, Nielsen, Southern California Gas Company, Watts Health, UCLA, Comerica Bank, Easy Choice Health Plan, L.A. City Workforce Investment Board, Kaiser Permanente, Metro PCS, AT&T and Cedars-Sinai. They would also like to extend a warm welcome to their new sponsors and partners, which include: Hep C Hope, PWA Los Angeles, Airbnb, USC, L.A. World Airports, Hyundai, Whole Foods, Uber, American Heart Association, CA Lottery, St. Vincent IPA, New York Life and UCLA Health. For more information, visit www.tasteofsoulla.org. Please visit and like Taste of Soul on Facebook, Twitter and Instagram. Don’t forget to download the Taste of Soul mobile App for the up-to-date information, prizes, giveaways, vendor locations, food and entertainment throughout the day. Don’t forget to hashtag your experiences and positive thoughts on social media with #ItsAFamilyAffair #TasteofSoul and #TOS16.